It was a very fun story and anyone who loves time travel stories should enjoy it. But I gave it 4 stars instead of five because it ended with a cliffhanger and I don't see any sequel. I'm very sad! 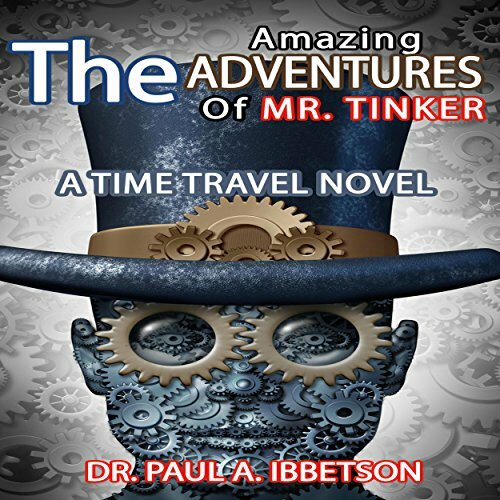 Where does The Amazing Adventures of Mr. Tinker rank among all the audiobooks you’ve listened to so far? Its an original take on time travel almost plausible. No one in particular. I was instructed in the lizzard men. Which character – as performed by Darren Stephens – was your favorite? The only part I am a little let down on is the end. I wanted more and it just ended. I even looked for sequels. Its a good book. The story gets me mainly from the time travel Tesla angle. But I was really interested in the blizzard men rom another planet. I recommend and I hope the author writes more. Mr. Tinker was one of the ten people in a team working for Nikola Tesla, when he discovers time travel using some little devices of his invention called chronoboxes. But the other nine scientists have their own interests in mind and decide to steal the chronoboxes and use them for their own good. Ibbetson's theory is that time is resilient, like an elastic band, and any change made in the past will not affect the future in the long term. This is why at first I did not know why he was so adamant in recovering the nine stolen chronoboxes. Later on Mr. Tinker explain Jovan about some weak spots in time where modifications are possible, and that he needs to recover the chronoboxes to avoid any possible disaster caused by the criminal scientists. Even though it took me some time to realize the motivation to recover the chronoboxes, I enjoyed the story. I found it interesting enough to keep listening to it. Sadly the book is just short of two hours, and it feels unfinished. It ends not exactly on a cliffhanger but just at the end of a chapter. I feel kind of cheated when this happens, since the writer did not even made the effort of publishing a completed story. The book is set in the 20s - 30s, and even though it is recently written, the language, atmosphere, and naiveté felt old fashioned, like with books written around that time. Darren Stephens' narration was very good and perfect for this kind of story. His speech is very clear and his tone engaging. I cannot say a lot about his voice range since there are few characters in the book, and none of them is feminine. The audio production was good. I found the premises interesting enough to want to know more about Mr. Tinker and whether he will recover all chronoboxes. Sadly, after two years, I am not sure whether Ibbetson will continue writing about this story. I received a copy of this book in audio format from the publisher in exchange for a honest review. Oh I really enjoyed this story and the story line is absolutely enjoyable and fun. My only complaint is that it was to short. Will definitely follow this author!!! Summary: Mr. Tinker, in of Nicola Tesla's associates, works with a young assistant named Jovan to try and recover 9 missing timetravel devices. - This book is really more of a novella. It doesn't really have an ending either. It's more of a part 1 of 3 or 4. As a big fan of closure, that's disappointing. That said, the story that is here is interesting. - Jovan's an orphan who's taken in as an apprentice to this brilliant professor. In 59 pages, there isn't a lot of time to develop their characters, but a lot happens. They meet up with Hitler, visit Woodstock, and much more. - The tiger and little aliens are interesting side characters. - Time travel books can be exciting because there's no way to predict what's to come. - Content warnings: There are a few curse words near the end, ~ last half hr. Their trip to Woodstock leaves them with some striking images burned on their brains. Conclusion: Neat intro to an intriguing series but lacks the closure that would have made it a great story.